The North American T-6 Texan is a single engine fighter trainer aircraft that was used to train US, Canadian and British forces during World War II and through the 1950s. 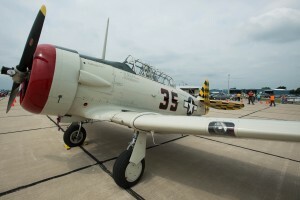 The T-6 is known by a variety of designations – the AT-6 (USAF), the SNJ (USN), and is most commonly known as the Harvard outside the United States. Our aircraft is an AT-6D. More than 17,000 T-6 airframes of various designations were produced. Today there are still more than 350 in airworthy condition. The T-6 was known as the “pilot maker” for its role in preparing Allied pilots for combat. It is an excellent trainer, possessing the handling characteristics of fighter and the capacity for full aerobatic manuevering. In World War II, pilots logged considerable hours in the T-6 before moving up to the faster P-51 Mustang. Even now, insurance companies require significant time in a T-6 before agreeing to insure a pilot for the P-51. 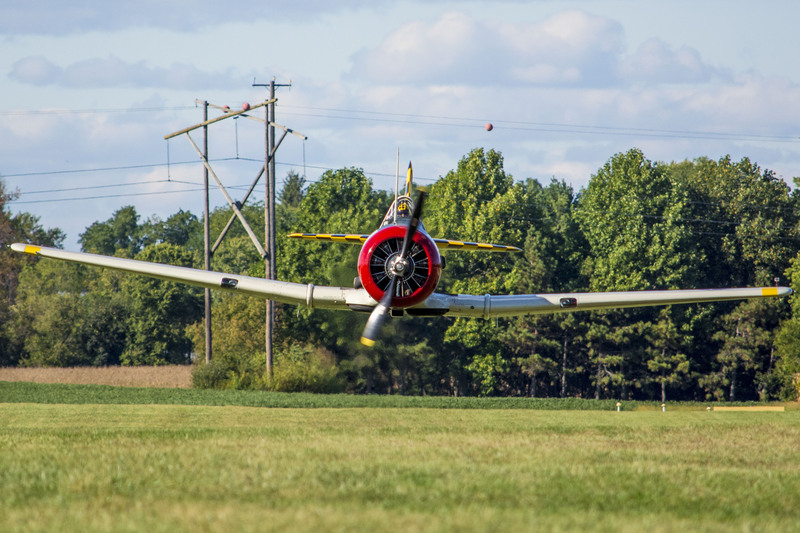 Our T-6 is owned by Nathan Davis and operated by the Warbird Training Center based out of Kokomo, Indiana. #35 is a tribute to the 325th Fighter Group called the “The Checkertail Clan”. It is available for airshows, orientation flights and film work. If you’re interested in taking a flight in our T-6, click here to check out our flight package options! 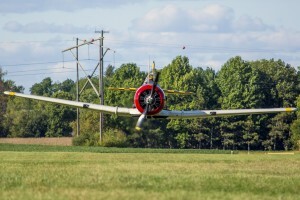 Our friends at warbirddepot.com have some breathtaking photos of our AT-6D, along with excellent detailed background on the T-6 in general. Our T-6 was completely restored from the airframe up by Midwest Texans. Every part of the original airplane was replaced with new or reconditioned. “Checkertail” is meticulously maintained and is as clean and crisp as the day the original airplane rolled off the assembly line. This makes for a very comfortable and enjoyable rider experience while maximizing safety and aircraft reliability. “Checkertail” is uniquely suited for air-to-air photography work. The canopy slides fully open, the rear control stick is removable and the seat rotates 180 degrees to face backward, affording photographers and videographers a nearly unobstructed 270 degrees of visibility in the air.